— Charles Bernstein, excerpt, "Memories"
Thailand & Japan: BUDDHA'S BIRTHDAY. Children's holiday; dancing & the release of captive animals. CUCKOO DAY (moveable feast): The hearing of the first cuckoo call of spring is a traditional excuse for taking the day off work & engaging instead in the more fruitful activity of toasting in the bird with 'cuckoo ale'. 563 -- [BC] This Budd's for you. 1341 -- Petrarch crowned poet laureate, steps of capital in Rome. 1614 -- Death of Domenikos Theotokopoulos, known as "El Greco," painter. 1695 -- Johann Christian Gunther lives. Briefly studied medicine at Wittenberg; then, disinherited by his father in 1719, who opposed his poetical ambitions, he will compose his greatest work, Leonorenlieder , a confessional poem in which he pleads to his father for mercy. 1712 -- US: New York City slave revolt suppressed, 21 are executed. 1798 -- Ramón de la Sagra y Periz, anarchist, lives (1798-1871). 1819 -- Walter Scott begins dictating The Bride of Lammermoor as gallstones make the act of writing impossible. 1826 -- US: Secretary of State Henry Clay & Senator John Randolph, who accused Clay of striking a "corrupt bargain" to steal the 1824 Presidential election from Andrew Jackson, fight a duel in Virginia. Like most politicians, they both missed. 1864 -- US: 13th Amendment passes, abolishing slavery. Does not include wage slavery. 1871 -- Robert Louis Stevenson, 21, walks with his father & tells him he is abandoning a career in engineering for writing. 1872 -- US: Colville Indian reservation created east of Columbia River; after white farmers pressure the government, a second reservation, on less arable land, is designated instead. 1873 -- Merdre! Merdre! Alfred Jarry lives. French poet, novelist, playwright, freelance scoundrel & author of Ubu Roi , a forerunner of the Theatre of Absurd. Among other accomplishments, was Pablo Picasso's weapon supplier (Picasso used the pistol to shoo away bores) & making his mark on 'Pataphysics' (the acceptance of every event in the universe as an extraordinary event). Died of alcoholism & tuberculosis. See 10 December & 1 November. "We the undersigned declare to have occupied, arms in hand, the municipal building of Letino in the name of the social revolution." 1885 -- Panama: Yes, We Have No Ripe Bananas? US Troops invade, to "protect US interests." 1888 -- France: Launching of the daily newspaper of the possibilistes, Le Parti ouvrier , which became a weekly magazine of the Allemanist tendency in 1890. 1893 -- Mary Pickford, (Gladys Mary Smith) actress, lives, Toronto, Canada. Raffaele Schiavina (1894-1987) lives. Schiavina collaborated on many anarchist newspapers (in Italian). He was imprisoned & later expelled from the "land of the free" in 1919 for anti-war activities. In Paris, he participated in the defense of Sacco & Vanzetti. Schiavina was imprisoned (Italy) & harassed (France) numerous times before returning to the US where he published, for 45 years, the weekly magazine Adunata dei Refrattari (longest lasting paper of the Italian-American anarchist movement). Among his noms de plume: Cesare; Nando; Michetta; Calibano; Max Sartin; Labor; Manhattanite; Bob; Juan Taro; X.Y. ; R.S. ; & M.S. See his Autobiographical Notes at the Kate Sharpley Library, translated from Bollettino Archivio G. Pinelli (Milan). No. 13, August 1999. 1898 -- Yip Harburg, American lyricist, lives. Wrote "Somewhere Over the Rainbow." 1898 -- Maurice Bowra lives, Kiukiang, China. Among his Greek translations is Pindar's Pythian Odes . 1902 -- Guatemala: Eruption of Santa Maria volcano leaves 1,000 dead. 1909 -- US: Federal court in Buffalo, NY invalidates the citizenship of Jacob A. Kersner, Emma Goldman's legal husband; threatens Goldman's claim to US citizenship & results in cancellation of Goldman's trip to Australia. 1909 -- American novelist John Fante lives. Stricken with diabetes in 1955, its complications brought about blindness in 1978 & leg amputations, but John continued to write by dictation. The key figure in Fante's resurrection was novelist/poet Charles Bukowski, who discovered one of his books in the public library while "starving & drinking & trying to be a writer," & who subsequently described Fante as his "god." By the late 1970s Bukowski was an international success & in a position to urge his publishers, Black Sparrow Press, to reissue Ask the Dust , "the finest novel written in all time." Despite his near invisibility, Fante still maintains a strong cult following. He remains a favorite of readers who enjoy bohemian urban fiction in the vein of Charles Bukowski, Jack Kerouac, & Knut Hamsun. 1913 -- US: Beloved & Respected Comrade Liberal Woodrow Wilson becomes the first US President since George Washington to appear before Congress. 1916 -- US: Emma Goldman gives a lecture on birth control at the New Star Casino, in NY, for which she is arrested & put on trial on the 20th. 1926 -- England: Emma Goldman lectures in Norwich (part of a series on dramatists begun on March 25th). "The day dawned bleak & chill, a moving wall of grey light out of the north-east which, instead of dissolving into moisture, seemed to disintegrate into minute & venomous particles... She wore a stiff black straw hat perched upon her turban, & a maroon velvet cape with a border of mangy & anonymous fur above a dress of purple silk, & she stood in the door for a while with her myriad & sunken face lifted to the weather, & one gaunt hand flat-soled as the belly of a fish...."
1929 -- Ironic French folksinger Jacques Brel is alive & well. Ken Knabb's "Georges Brassens & the French 'Renaissance of Song'" is an excellent introduction to the French folk/cabaret scene. See also Kenneth Rexroth's "Subversive Aspects of Popular Songs." 1937 -- Canada: United Auto Workers (UAW) strike at General Motors plant in Oshawa, Ontario, for recognition. 1937 -- Spain: In "Ideas," Jaime Balius' article entitled "Let's make revolution," he critically argues, "if [Companys] had a larger contingent of armed forces at his disposal, he would have the working class back in the capitalist harness." 1938 -- Big Band leader Joseph "King" Oliver dies. 1939 -- Trina Schart Hyman, author & illustrator, lives. 1939 -- Emma Goldman sails for Canada, arriving in Toronto on April 21, where she establishes residence. 1945 -- France: Congress of the Federación Ibérica de Juventudes Libertarias (FIJL), in Toulouse (April 8-9th). Participants include Victor García, who assumes responsibility for publishing the journals Ruta & Solidaridad Obrera , puis de secrétaire de la IJA (Jeunesse Anarchiste Internationale). 1946 -- League of Nations assembles for last time, passing a motion declaring themselves to be — dare we say — out of their league? 1950 -- J. D. Salinger's best known short story, "For Esmé — With Love & Squalor" appears in The New Yorker . 1950 -- Spain: José Lluis Facerias, anti-fascist guerrilla, blows up the Lonja police station in Barcelona. Facerias was a veteran leader of the anarchist action groups, operating since the end of the Spanish Revolution in 1939. 1953 -- First major 3-D movie ( Man in the Dark ) premiers. 1956 -- US: Six recruits at Paris Island Marine Base drown when their drill instructor, Staff Sergeant Matthew McKeon, disciplined them for "minor disorderliness" by marching them into a tidal swamp. He taught 'em good. 1959 -- France: Felipe Alaiz de Pablo (1887-1959) dies, exiled in Paris. Anarquista & journalist. Director of Revista de Aragon , writer for El sol de Madrid, Heraldo de Aragon, La Revista Blanca, Solidaridad Obrera de Valencia & Sevilla. Published novels & works on anarchism & translations. 1960 -- Folksinger Odetta appears at Carnegie Hall. 1966 -- US: Pole Cats? Last poll tax outlawed by Federal courts. 1966 -- US: The Jefferson Airplane opens at California Hall on Polk Street, Frisco. 1966 -- US: Show & Tell Time? Time magazine asks on its cover, "Is God Dead?" 1973 -- Spanish painter & communist Pablo Picasso dies, Mougins, Alpes-Maritimes, France. 1973 -- US: A Harris Poll reports 51% of Americans support the American Indian Movement (AIM) protesters occupying Wounded Knee, South Dakota; 21% support the federal government. 1974 -- Hammerin' Hank Aaron hits 715th home run, beats Babe Ruth's baseball record. His run at the record got him much hate mail & numerous death threats by whites. "Throwing a fastball to Henry Aaron is like trying to sneak the sun past a rooster." 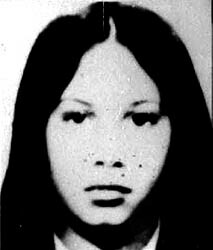 1977 -- Argentina: Adriana Gatti is today "disappeared" by government security forces. Adriana (8-9 months pregnant) was previously kidnapped from her home on March 31, but was set free on that day. Today is not so fortuitous. Her father, Gerardo Gatti, an Uruguayan anarchist labor militant, was also "disappeared" by the Argentine government in 1976 — tortured & put up for ransom before being murdered. 1978 -- Gaston Leval dies. Son of a French Communard, anarchist syndicalist, combatant & historian of the Spanish Revolution of 1936. "It's the media's responsibility to examine the President with a microscope . . . but when they use a proctoscope, it's going to far." 1984 -- US: Beloved & Respected Comrade Leader acting President Ronnie Reagan's Defense Secretary Caspar Weinberger says "The United States is not mining the harbors of Nicaragua." — an indefensible lie. 1986 -- US: The Motion Picture Association of America rules that all movies that refer to illegal drugs will be given nothing below a PG-13 rating. 1988 -- The self-extinguishing armchair is invented. Gone but not forgotten! 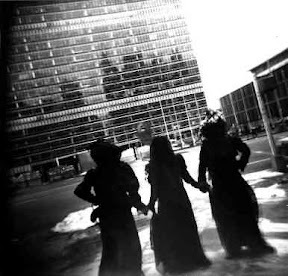 1993 -- Sweden: Women in Black demonstrate in solidarity with their Serbian sisters, Lund. "DO NOT SPEAK FOR US, WE WILL SPEAK FOR OURSELVES "
1993 -- World Court orders Serbs to cease genocide in Bosnia. Why oppose genocide only in Bosnia you ask?? 1993 -- Germany: "Libertarian Days" April 8-12th, held for the second time at the University of Frankfort, including the "Libertarian Book Fair." 1995 -- US: 1,000 Jobs With Justice Washington state activists in Bellingham, Tacoma, Olympia, Seattle & Yakima rally against the Republican "Contract With America." 2001 -- US: The head of National Ethnic Coalition of Organizations demands an apology Saturday from Jay Leno for his comment that Hizzoner Rudolph Giuliani is "fascist" for appointing a "decency" committee on art. In a departure from his usual schtick, Leno on Thursday labeled Giuliani a "fascist" for appointing a decency commission to determine whether certain pieces of art are offensive. The comedian compared Giuliani's efforts to Adolf Hitler's crusade to remove what he called "degenerate art" from German museums in the early years of the Third Reich. 2002 -- US: Court Overturns Book Store Order. The Colorado Supreme Court refuses to order a bookstore to turn over its sales records to police, overturning a lower court decision demanding the records as part of a drug investigation. The First Amendment & the state Constitution "protect an individual's fundamental right to purchase books anonymously, free from governmental interference,'' the court ruled. The decision overturns a Denver district judge who ordered Tattered Cover Book Store owner Joyce Meskis to tell police who purchased two books on drug manufacturing from her store. The Tattered Cover, one of the country's largest independent bookstores, was assisted in the case by the American Booksellers Foundation for Free Expression. What about the Police who buy these books for 'official' business? if we were to make this information public, you can be sure they would have an apoplectic fit. 2003 -- US: Baseball Hall of Fame president cancels a planned celebration for the 15th anniversary of "Bull Durham," citing recent comments by film co-stars Tim Robbins & Susan Sarandon as potential dangers to US troops in Iraq. The celebration was to take place April 26 & 27. In protest of the cancelation, on the 11th sportswriter Roger Kahn cancels a planned appearance at the baseball museum. 2003 -- Iraq: Deaths of three journalists in Baghdad: Two American air to surface missiles hit the Qatar satellite station Al Jazeera's office in Baghdad, killing a reporter & wounding a cameraman. The nearby office of Arab satellite channel Abu Dhabi is also hit. Al Jazeera accuses the US of attacking Arab media to hide facts. Meanwhile a US tank fires into the 15th floor of the Palestine Hotel in Baghdad, where most remaining foreign journalists are based, killing two cameramen. 2010 -- Chile: Renaming Santiago International airport for poet Pablo Neruda nixed. This land is not for you & me.